The web is full of articles about the upcoming Leo New Moon. New Moons always attract our attention,which indeed they merit. However – the Balsamic lunar phase, where we are now, does not attract nearly as much upfront focus. It should, in my view…and I am not alone here! 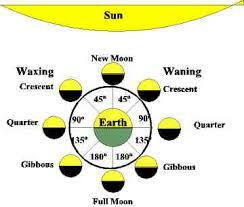 The Balsamic lunar phase begins with the waning Sun/Moon semi-square. The Moon is a slim Crescent, forty-five degrees behind the Sun – that beautiful, fragile, slender waning crescent moon which we may see each month if the skies are clear. Then it disappears. We are in Moondark now, the latter part of the Balsamic phase, the last couple of days of the dying energy of the previous month’s Cancer New Moon. This entry was posted in The Sun/Moon Cycle, New Moons & Moondark (8articles) and tagged Astrology, Balsamic Moon, horoscope, Moondark, Progressed Lunar cycle. Bookmark the permalink. Thank you for this. I’m a Balsamic Moon baby myself, born with a Leo Moon (conjunct Ascendant) almost exactly 30 degrees before my Virgo Sun (a couple of days before a Virgo New Moon I think). I guess being in Balsamic phase is another reason I’ve always had to balance out my Leo enthusiasm – thought it was just my Virgo Sun (square Saturn)! I’m also mid-way through a progressed Balsamic Moon cycle, with my progressed New Moon in Scorpio happening in just about 2 years from now. Interestingly, my progressed Venus will be conjoined with my progressed Moon and Sun same degree. Anyway, things are not so bad, but I guess it’s good that I’m not trying to start anything new right now! Melody, this is such an affirming response, thank you. Your artwork and reflection is beautiful – I’ve shared it on Twitter, and would encourage any of my readers to go through and read your evocation. Thanks so much, I absolutely agree with our need for rest and retreat. Have shared. Thanks for dropping by, Jen. Glad you liked the article. Beautiful. I have a balsamic Leo Moon too, conjunct a Virgo Sun. I do cherish very much my retreats before the New Moon. This upcoming eclipse will actually happen right in the midpoint of that conjunction. Thanks, Fernanda – glad you appreciated the post. There is a great deal to be learned about the Dark Moon from Demetra George’s book”Mysteries of the Dark Moon”, including concerning the historical links to the power of that particular lunar phase. I think the book is worth having in your collection. Here is the link to an article I wrote a couple of years ago which gives you links through to other writers on the topic of the Dark Moon – I hope you find it all useful info for that talk! I’m going to have to figure out how, etymologically at least, the balsamic moon and balsamic vinegar are related. As soon as I read “balsamic,” I was overcome with desire for a salad. This requires more exploration! Love the Moondark, Anne. 🙂 My natal Mars is in Leo, so it’s a bit of a homecoming and Mars return as well as New Moon. Plus the lovely upcoming trine to Uranus and Saturn in the fire signs (and my natal Venus at the G.C. as well). I’ll have to check the time of the New Moon … we still in Dark ‘o Moon just now? xoxo Happy Moondark. Thanks, Jamie, always great to hear from you…The Leo New Moon is on Sunday morning 23/7 at 9.47 am GMT here in the UK. This should be a dynamically creative New Moon for you…enjoy! Thanks for the article Anne :). I agree that many focus on the New Moon and its new beginnings, just as much of society and how it structured is focused on extroversion rather introversion, and introverts get bad rap, just as the balsamic moons do. I am also a balsamic moon a ‘monks moon’ and yes much of my life’s relationship have been about endings. For instance my first friend at school, died after we went for a run, and she fell over ( she had juvenile osteoarthritis), followed by another friend who died from pneumonia and another from a car accident, all within 5 months of me starting school.. The pattern has continued all my life! The balsamic stage is about ‘letting go’ and allowing the wisdom from all that learning to be the foundation for new beginnings that are always decades ahead of the crowd, and aren’t recognised in their own time! I also find that much of my life is that of a ‘transformer’ in that I create the pattern for the change, initiate it, am chastised for it, and then later on, other people recognise it, take up the ideas and get the recognition for it! It is not easy being a balsamic moon, yet I feel that we create and leave the seeds for the future. As Pluto is now transiting my 12th house ( seems to have been there forever) and Neptune and Uranus before that, and soon Saturn will enter too, and is there in my progressed chart too, I feel that life is giving me a double whammy of balsamic energy, and teaching me to withdraw so that I can bring my greatest creative dreams to fruition :). It however, does not make me very outwardly sociable, although I am behind the scenes.